adding bookmarks directly into sidebar (which would be some sort of sidebar + bookmarks bar combined) -> there's a lot of space on sidebar that could be arranged, I think possibility of putting few bookmarks there would be great. refers to the news tab - it would be perfect if there was an option to fetch or add RSS sources also. 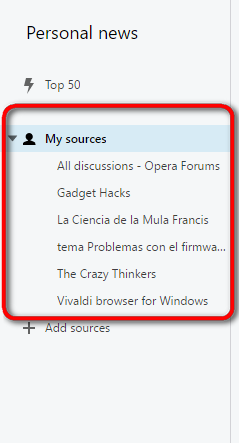 Welcome to Opera's forums @Hayek29! Firstly try posting in Suggestion box, one post for each suggestion.